NEWPORT, R.I. — On the heels of the most dramatic and most competitive edition of the Rolex New York Yacht Club Invitational Cup—with the top four places decided on the final leg of the regatta—the New York Yacht Club has committed to use the Swan 42 yacht for sailing’s preeminent Corinthian competition through 2019. The Swan 42 class was created in 2006 by a group of New York Yacht Club members; it’s the eighth one-design class sponsored by the Club and was integral in the creation of the Rolex NYYC Invitational Cup, which has been run every two years since 2009 out of the New York Yacht Club’s Harbour Court clubhouse and the Royal Cork Yacht Club has ccompeted on each occasion. The Swan 42 National Championship is held each July in the waters off Newport, R.I., and has seen as many as 20 boats contest for the title. The boat has also developed a strong following in Europe, with 12 boats racing in a one-design fleet at the 2104 Rolex Swan Cup. “The Swan 42 Class is honored by the New York Yacht Club’s continued commitment to utilize the boat for the Rolex NYYC Invitational Cup,” says John Hele, Swan 42 Class President. “With a dedicated group of owners in the United States and Europe, we expect the Swan 42 to provide unparalleled Corinthian one-design big-boat sailing for years to come. Additionally, the boat has more than proven its ability to win under a variety of handicap rules.”. Of course, there’s no place the boat is more at home than on the racecourse for the Rolex NYYC Invitational Cup. Committing to the boat for two more cycles provides stability for competitors, sponsors and the organizers, and will allow the event to grow even further. The Rolex New York Yacht Club Invitational Cup is a biennial competition between yacht clubs, with strict eligibility rules ensuring that each team is comprised almost exclusively of amateur sailors who are members of the club they represent. The competition, which was first run in 2009, has drawn entries from 22 nations on all six inhabited continents. The New York Yacht Club won the inaugural event in 2009, with the Royal Canadian Yacht Club winning in 2011 and 2013 and England’s Royal Thames Yacht Club winning in 2015. The three berths allocated for United States clubs are decided at the U.S. Qualifying Series regatta, which is held on even years in smaller boats. 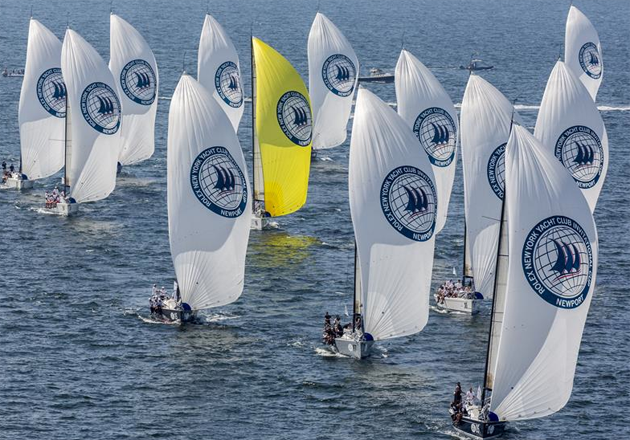 Clubs from Maryland, Washington, Massachusetts, New York and California have competed in the Rolex NYYC Invitational Cup.